"The bedside tables you made for us are beautiful and very high-quality. We're really pleased with them. Thanks!" "The craftsmanship of the piece Hastings Hill helped us design far exceeded our expectations and has definitely become one of the centerpieces of our home." "The table was meticulously handcrafted for excellence and artfully styled. It now adds charm and beauty to our home." "My coffee table is beautiful. The wood is gorgeous, the design is simple and elegant, and the craftsmanship is superb. It is perfectly sized for my small living room." "My wife and I are thrilled with the handmade custom night tables you produced for our home, they truly are beautiful!" Every table and cabinet we build is made to order, directly for you. The customer has many choices in the selection of a piece of our furniture: wood type, dimensions, details and profiles, hardware, finish tone, and more. We will want to talk with you about all your creative options so that our finished product matches your wishes in every detail. This is not just checking boxes on an order form. With Hastings Hill Woodworks, you actually get to talk with the very craftsman who will be working on your future heirloom. Together, we will sift through various points of style and function to create the piece that is just right for you. The items in our gallery exhibit many of the traits we find most attractive. Each piece was created to exactly meet the desires of our customers  comfortable heights, favorite profiles, common colors, flexible uses, room limitations. We can easily blend elements of previous work or add new lines to existing designs. You can even present to us an idea for a completely new design. We are happy to work with you on the details! In addition to what you see in our gallery, we can build all sorts of other pieces: dining tables, traditional folding secretary desks, a corner cupboard, a customized home office station, a regular or flat-screen entertainment center. Our design book constantly gathers new sketches and ruler data. Each design is later revised and refined until it achieves a balance in proportion and function, in appearance and performance. Then we bring it to life. The first step is to contact us and tell us what interests you. We will respond quickly and provide you with estimates of cost and completion during the design process. Contact us today! Hastings Hill Woodworks is ready to build you a top-quality showpiece (or two) that you can cherish day in and day out, and which you in turn will proudly pass down to your loved ones. Most of our furniture is built in either cherry or curly maple. Other woods are available. Pieces which are to be painted are typically done in poplar, a lighter weight hardwood which is solid without being too massive. Its smooth, even grain also happens to take paint very well. We do not use any plywood, fiber board or veneer in our construction. Our drawers are all hand-dovetailed, one at a time, and utilize a solid wood bottom for strength, feel and longevity. Once an overall design has been selected, you have the opportunity to tailor dimensions to precisely meet your needs: a drawer can be made deeper, a tabletop can be raised to match the arm of your chair, or an entire piece narrowed to fit between the sofa and the wall. Hastings Hill Woodworks can also advise you on "standard" dimensions for table height and other functional issues. Tabletops may be edged in various ways. 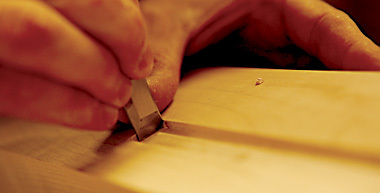 Examples include the bullnose, quarter-round, breadboard end and raised bevel. Table aprons, case apertures and backboards may be given a bead in order to break up a neighborhood of straight lines. 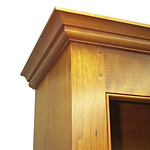 If your piece features applied feet or moldings, we can show you a family of profiles from which to choose. Backsplashes and surrounds can be raised, lowered or even eliminated, but on the right dresser or stand we find them quite attractive and very, very helpful. To complement our finished work, we prefer the look and feel of antiqued brass hardware, but polished brass, nickel, wrought iron and wood are also options to consider. We like simple loop pulls and knobs, but many more ornate choices do exist. An adjustable shelf may use either brass pins or hardwood supports, depending on the overall design you choose. For our stain and clearcoat finishes, Hastings Hill Woodworks prefers to use only water-based products. 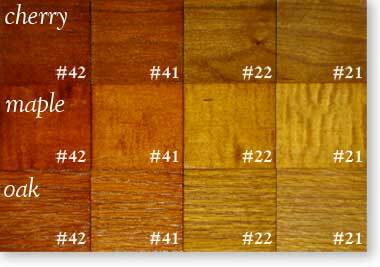 Our stain is available in a variety of color tones, of which the most commonly requested is a medium brown. From this general starting point, the pigment can be lightened, darkened, reddened or brought toward the amber side of the spectrum. Or if you happen to prefer the unaltered tones of beautiful hardwoods, we can always omit the staining process altogether. Either way, you will see the color in the grain without having to peer through a mask of pigment to find it. The penetration of waterborne dye leaves nothing standing between the flowing grain of the wood's surface and the lustre of our topcoat. Finally, we give each piece a healthy layering of a water-based "lacquer," inviting your eyes to gaze inside while keeping the wear and tear of years of service on the outside. Our most popular sheen is a semi-gloss. When we complete the final polishing, your Hastings Hill piece will beam with the "dull glow" that is so prized in many centuries-old masterpieces.